We adore this embroidery font! We've also included a satin stitch heart to add to the middle of letters as shown in the name Maddie. Capital letters A thru Z, lower case letters a thru z, numbers 0-9, punctuation. 5 sizes included: .75, 1.00, 1.25, 1.50, and 2.00 inches Size refers to the average height of the letters in the set. We adore this embroidery font! 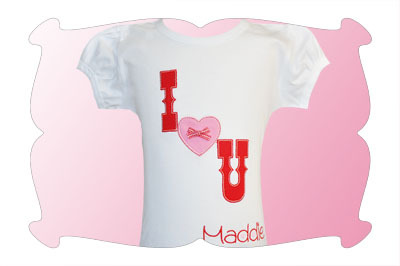 We've included a satin stitch heart to add to the middle of letters as shown in the name Maddie. The I Love U applique design is available as a separate purchase. The Maddie Embroidery Font comes in 5 sizes! .75, 1.00, 1.25, 1.50, and 2.00 inches. Size refers to the average height of the letters in the set. Upper Case letters A thru Z, lower case letters a thru z, numbers 0-9 and punctuation as shown.